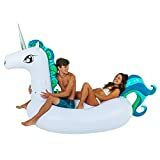 When it’s time to give your pool scene a makeover, add a little much needed life to it with these funny giant pool floats and rafts. We couldn’t love summer any more than we do. The only thing that’s been making it even better is all the cool floats we’ve been seeing recently. Where did these come from, by the way? It seems like we all settled for the generic solid blue raft for, like, 40 years and then all of a sudden floats just became a recent trend?! Either way, we’re into it. This season we’re seeing the funniest floats in some of our favorite foods (hello donuts and avocado!) and then there’s just the absolutely insanely giant floats that are anywhere between 6′-10′ tall (hello flamingo and unicorn!). While all of these rafts are a blast, it’s important to keep in mind that none of them are actually life saving devices. They’re just for fun to float around on. 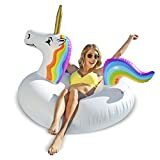 Ok, now that we’ve cleared all that up check out some of the most fun and giant pool floats (so far) in 2019. Because who doesn’t want to float all around their pool in a giant avocado?! If you’re obsessed with all things ‘avocado’ this is the raft for you this summer. Because the llama is the must-have animal everything in 2019! It’s really the new unicorn. Super cute! It’ll support adults up to 200 lbs. Now this is the life! You can lounge around on your very own oversized yacht. Even better? It can also hold your favorite bottles of rosé, wines, beers, or whatever else you’d like to drink. This one will fit two people and is over 9-feet long! Using an electric pump, it will quickly inflate in less than 2-minutes. It has a reinforced cooler area and 2 cup holders. You’ll never want to leave! It’s one of the most anticipated new rafts of the year! Who doesn’t love a big balloon animal that you can float around on?! This one comes in a cool eye-catching red. Get it while you still can! It also comes with an emergency repair kit too, just in case! Now you can blow up your insta-bae in just seconds! You’ll never be alone when your BF is right by your side, in the pool, at all time. Literally, all times. Eh, maybe we need to have a talk. Relax in style this summer by being the real angel you are. Ok, sure. Well at least now you can pretend you’re one and look great while doing so. It’s 72″ long x 108″ wide. Mmmm pizza! If you’re like us and dream of pizza when you sleep, why not daydream of pizza when you’re in the pool? This killer pizza slice has some pepperoni on it and, well, we’re not hating it. Not great for people with a dairy allergy. You’ll always be flying first class when you’re floating around on your very own oversized private jet! It can fit up to 2 adults too. You always need a flying buddy. It’s over 6-feet long and can fit up to 2 adults. Every float purchased provides one person, one year of clean drinking water in the developing world! Because your whoopee cushion was funny when you were little and, well, it’s still funny as an adult. 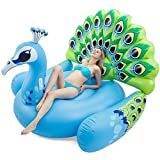 Float around your pool in this giant raft and feel free to make the fart noises yourself. Blame the float or blame anyone else in the pool. 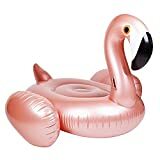 If you just shouted “Rosé All Day” then this is the pool float for you! Just think you can be sipping on some rosé while floating on your very own rosé raft. Dreams do come true! It’s over 7.5-feet long! That’s one big bottle! Because who doesn’t love a traditional rubber ducky, especially when who looks like he’s 100% over it. That side-eye is priceless. Plus, how cool are you going to look with this raft secured around your waist? That was a rhetorical question. Not a life saving device. Duh. A giant llama with a cup holder? Sold! 60″ long x 38″ wide. It’s one of the coolest peacocks of the season! We’re not sure if it’s giving us the side-eye, but it’s so artsy that we can’t love it any more than we do! This one is over 6-feet long and can hold up to 2 adults. It also inflates super fast (even faster with an electric pump)! Finally a cactus that doesn’t hurt. 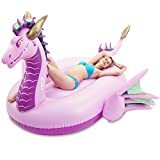 Float all over your pool and have a place to put your arms so you don’t end up with those terrible under-arm tan lines. You know the ones. Tip: Drink a margarita on it to get the full effect. It’s really one of the most trendy and magical rafts we’ve seen for the summer. This float is popping up all over Instagram in places like The Hamptons, Palm Springs and more. We can thank Urban Outfitters for that! It’s almost 6-feet long and about 3.5-feet wide. Pot of gold, not included (buy you knew that). It’s the one jellyfish you’ll actually want to come into contact with. It’s also semi-translucent so it’s going to look really pretty when the sun hits it floating around your pool. It’s almost 4-feet by about 4-feet. And it won’t sting you. Allegedly. It’s time to get off you smartphone and, literally, onto your tablet. This one is double the size so it can easily fit two people. Don’t forget to put your Out of Office on! It’s the most popular swan that you’ve seen, literally, everywhere in the past couple of years. Well, yours probably popped so it’s time to get a new one. Or maybe your old one needs a new friend? Perfect for the bacon lovers in your life this summer! This giant piece of bacon will float around your pool and almost looks good enough to eat. I mean, but don’t. The only thing that would make this raft better is if it sizzled in the sun. Eh, next year maybe. Your healthiest bacon option you can have this season. Who doesn’t love a classic round inner tube to float around in your pool? It’s giving us a total 80’s pool vibe and, well, we’re loving it. It’s one of the most refreshing floats we’ve seen all summer. You’ll love lounging on this watermelon raft all day long. You’re welcome! It’s not as large as we’d like, but perfect when you want to dunk part of your legs in the water. Because it’s Taco Tuesday every day this summer! We love a taco especially when it has an actual face on it. And don’t even get us started with that mustache. Ole! It’s a hard taco shell, but super soft to float on. We don’t really know what we think of this pool float. It’s almost so ugly it’s pretty. Who are we to judge? All we know is that it’s totally on-trend this summer and will break up that constant sea of white and pink swans we’ve been seeing all over the place. 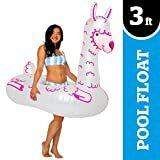 This is really where all the latest pool float craze began. The donut. Well, the strawberry donut with the giant bite taken out it, to be precise. If you can’t eat donuts every single day (our dream), then you might as well settle for floating around the pool in one. Also comes in chocolate frosted. Get both. Lounge around like the true royalty you are all summer long! I mean this is the statement your pool (or the lake) always needed. Good luck trying to mount this thing! It’s over 10-feet tall (!!!!). The base, alone, is 6-feet. You can fill the base with water if you wanted it to be a bit more stable. 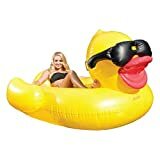 Who wouldn’t love to see this cute ginormous duck floating all around the pool?! Forget the fact that we think it looks like it’s slightly judging us. Not to be used as a raft (obviously). Now the pool party is really starting! This cute floating bar shark will hold up to 7 cups of your favorite beverages for you and your friends this summer. Plus, it even has a built in ice-chest under his fin! Please note, this shark doesn’t bite but still, you know, be careful.